A VW engine line in Mexico. WASHINGTON -- Auto industry trade groups said on Wednesday that tightening the rules of origin in the North American Free Trade Agreement could be disruptive and hurt the competitiveness of U.S., Mexican and Canadian auto plants. Their testimony Wednesday at a public hearing ahead of NAFTA renegotiations, expected to start Aug. 17, contrasted sharply with frequent comments from Commerce Secretary Wilbur Ross that the trade pact's local content rules are an area that needs strengthening to avoid being used as a "back door" for Chinese auto parts. 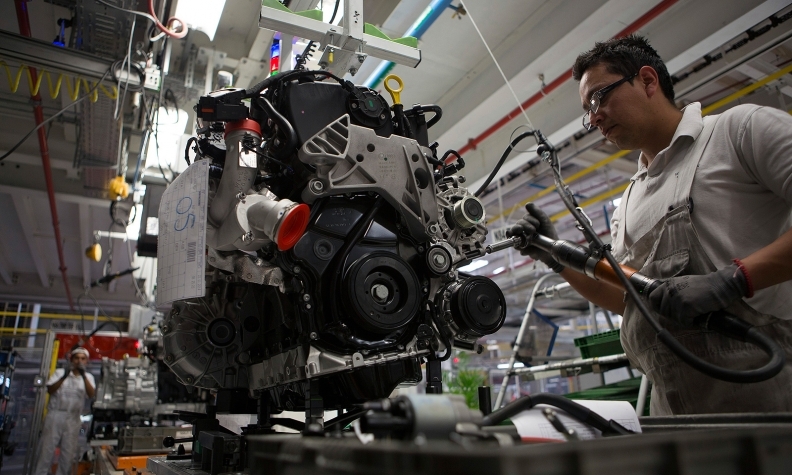 Matt Blunt, president of the American Automotive Policy Council, said the current 62.5 percent local content requirement in NAFTA was working just fine and "strikes the right balance" for encouraging local manufacturing investment and keeping the industry's costs competitive. Blunt, whose group represents General Motors, Ford and Fiat Chrysler urged a "very cautions and careful" approach for any origin rule changes and discussed the affects of stricter enforcement. "It could make us less competitive as compared to our international peers and affect our ability to export," Blunt said. "It could deny us access to supply chains which would drive up costs and could affect sales and ultimately employment within the industry." Ross has said that NAFTA's rules of origin need tightening to avoid benefiting producers from outside the region from tariff-free access to the U.S. market. He also has noted that vehicles now have many new electronic components that were not contemplated when the pact was negotiated in the early 1990s. But Blunt disputed that the origin rules were allowing China to benefit from NAFTA in a major way, arguing that Chinese components make up less than six percent of the value of North American-built vehicles. His comments were seconded by representatives of other groups, including the Motor Equipment Manufacturers Association, representing parts makers, the Alliance of Automobile Manufacturers, which includes Detroit and foreign automakers building vehicles in the United States, and the Association Global Automakers, a group that represents international automakers that sell into the U.S. market. Leigh Merino, senior director of regulatory affairs for MEMA, said auto components and subsystems in particular depend on complex "ecosystem" of diverse parts suppliers and small changes to this "can be extremely disruptive." Nonetheless, the trade groups said that they were not opposed to examining ways to improve the rules. The NAFTA hearings, which allow industry groups and companies to express views on the U.S. negotiating objectives for the talks are expected to conclude on Thursday.